​Four more water detritiation tanks have been delivered to ITER as part of its fuel cycle system. 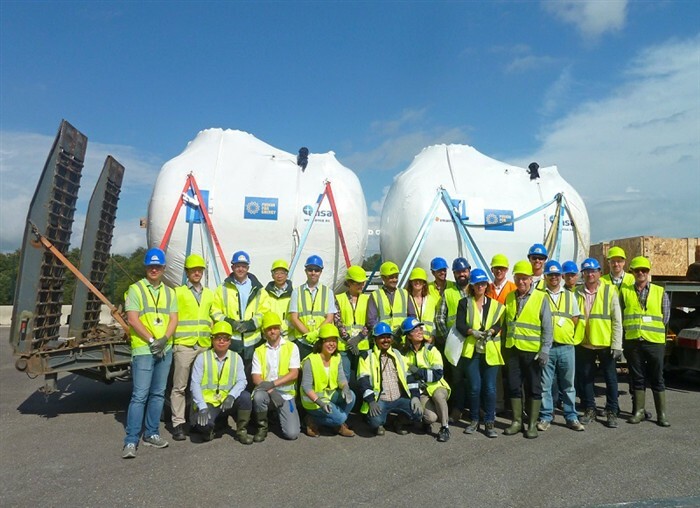 The components resulted from a contract signed between F4E and Equipos Nucleares, SA (Ensa) in order to design, manufacture and deliver them to the site of the project in Cadarche. Works for their fabrication lasted approximately two years reaching a value of approximately 1 M EUR. Two tanks measuring 7 m3, known as "holding tanks", will be used to store water. The two additional tanks, measuring 12 m3, known as "feeding tanks", will be used to feed the fuel cycle system with tritiated water. All four tanks will be installed next to the six water detritiation tanks, also manufactured by Ensa, which have been on-site since March 2015, claiming the title of Europe's first-ever components delivered to ITER. The biggest fusion device will count ten of these tanks in total in order to cater for the needs of its fuel cycle. Why do we need a water detritiation system in the ITER Tritium plant? The answer is simple: because we need to recover the fuel to use it again so as to trigger off a new fusion reaction. Here is how it works in few simple steps: first, the two hydrogen isotopes (deuterium and tritium) are supplied to the machine through the Tritium plant; second, when the two isotopes reach the core of the machine they are heated at extremely high temperatures in order to fuse and to release energy; then, the fuel left from the fusion reaction, together with other gases, return through pumps to the ITER Tritium plant in order to recover the tritium and use it in a future reaction. The company located in Cantabria has been awarded this contract following a procurement procedure launched by F4E. "The manufacturing of these additional tanks and their delivery to the ITER site conclude Europe's contribution vis `a vis the fuel cycle tanks. Our good collaboration with Ensa and the co-ordination with ITER IO have been fundamentally important for the successful completion of this task" explained Josep Benet, F4E Technical Officer. Sofía Corino, Ensa Special Projects Manager, Business Development Area said, "Ensa, in cooperation with its subsidiary, ENWESA, has been responsible for the design and manufacturing of the four additional water detritiation tanks which will be part of ITER's fuel cycle system. The expertise and commitment to innovation of Ensa have been decisive to consolidate it as one of the leading European manufacturers of components for the biggest fusion energy project."